Microneedling is a minimally invasive procedure that has little to no downtime. A device is used to create microscopic channels in the skin that induces collagen restructuring and growth. Schedule your complimentary consultation with our master estheticians to discuss if microneedling is your best option for rejuvenation. Every client visit is personalized to achieve the best results for you! Microneeding causes micro-traumas to the skin that stimulates the body’s natural wound healing process. The result is improvement of fine lines and texture of the skin with minimal downtime. PRP or Platelet Rich Plasma is obtained by a simple blood draw. The blood is then separated into its components by centrifugation. The PRP component is obtained and contains a high concentration of growth factors along with platelets. Because of the high concentration of growth factors, PRP has been used for many years for orthopedic, maxillofacial, cardiac and skin healing procedures. Combining microneedling and PRP has demonstrated cosmetic improvement over microneedling alone. 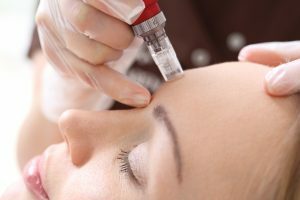 The serum obtained is applied topically during the microneedling procedure and not only improves the results, but also assists with gliding of the device and comfort. Call us to learn more about this exciting procedure offered at Auburn Med Spa! Learn more about microneedling at Skin Pen ®. See before and after photos at Skin Pen ®.